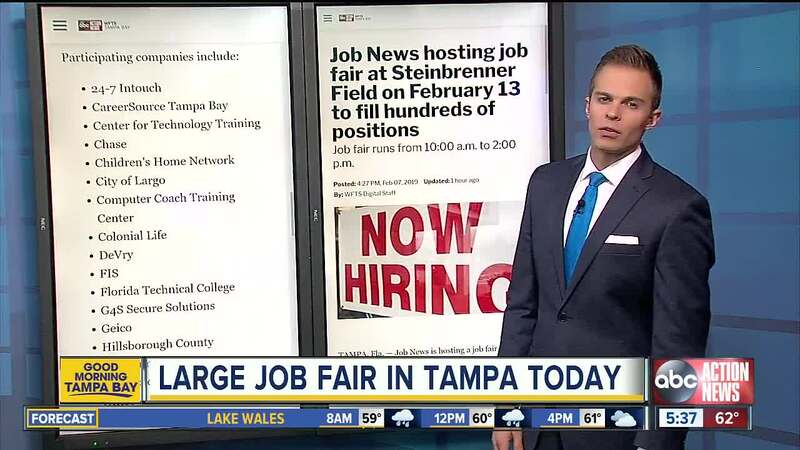 Job fair runs from 10:00 a.m. to 2:00 p.m.
Job News USA is hosting a job fair at Steinbrenner Field on February 13. TAMPA, Fla. — Job News is hosting a job fair in Tampa on Wednesday, February 13 to help fill hundreds of open positions. Recruiters from twenty Tampa Bay area companies will be on hand to meet and interview prospective applicants. The job fair is being held from 10:00 a.m. to 2:00 p.m. in George M. Steinbrenner Field's Event Pavilion across from Raymond James Stadium. You will have the opportunity to build your network and meet with recruiters one-on-one. There are employment opportunities for people of all experience levels and skill sets. Full-time and part-time jobs as well as veteran-friendly positions are available. Attendees are encouraged to bring at least 20 copies of their resume and dress professionally. Parking and admission to the fair are free. For more information on specific jobs available or to pre-register for the job fair, visit www.jobnewsusa.com .